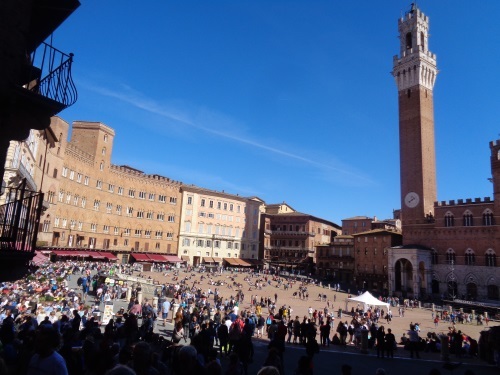 Piazza del Campo is the most famous square in Tuscany. 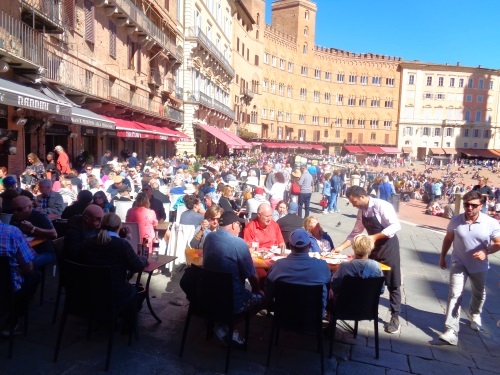 The huge, uneven square in the centre of Siena is a meeting place for people from all over the world. The most famous building in Piazza del Campo is the Palazzo Pubblico Town Hall with the Torre del Mangia, over 100 metres high. During the many warm days in Tuscany, thousands of people, most of them tourists, simply sit on the ground in Piazza del Campo. You often quickly get into conversation with strangers. Especially in the evenings in summer there is a lot going on. 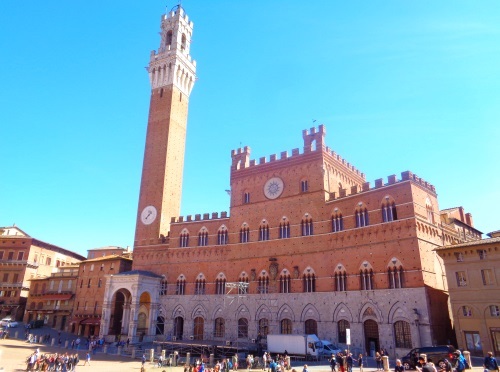 The most striking building on the square is the Palazzo Pubblico, the many centuries old town hall. Today you can enter the palace. The interior is particularly famous for the frescoes on the walls of the large halls and the Torre del Mangia. Visitors can climb this tower and enjoy the magnificent view of Siena and its surroundings from above. Location: The Piazza del Campo is in the middle of the famous old town of Siena, it is the centre of the city. It is best to walk to the square of Siena. The famous cathedral of Siena is not much more than 100 meters away from the square. The tickets on the Internet with quick admission for the cathedral cost 17 euros. More information and booking on the excellent ticket website Getyourguide. Palio: Every year the Piazza del Campo hosts one of the most famous and toughest horse races in the world, the Palio. It is held twice a year in summer, on 2 July and 16 August. Then in Siena all hotels are very expensive, tickets for the race are hard to get. The Palio riders come from 17 different parts of Siena. The horse race in Siena on the gigantic town square has a many centuries old tradition. The gigantic square is in the heart of the city, the world-famous Duomo di Siena is about 100 meters west.